In 2008, Laws Stained Glass Studios installed (8) faceted glass windows at Greater Little Rock Baptist Church in Macon, GA. 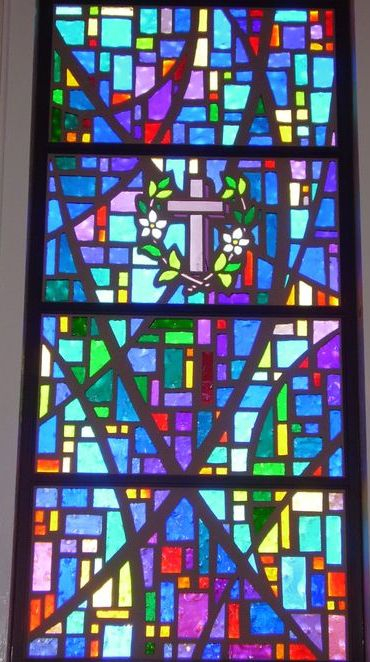 The six main sanctuary windows (size 56" wide x 121" high) each contained a symbol placed in an abstract design. The two smaller windows (size 46" wide x 121" high) each had a symbol as well. Laws began the installation by removing the existing metal frames. Laws covered any remaining wood with dark bronze aluminum flashing and then set a new dark bronze aluminum frame. The faceted glass windows were placed in the new frame. Close-up showing how some of the existing wood frame was flashed.